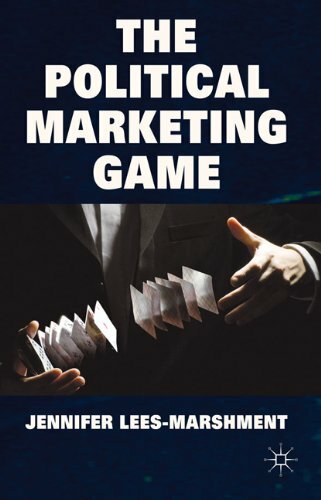 The Political Marketing Game by Jennifer Lees-Marshment is about as thorough an analysis of a discipline, regarded as much an art as it is a science, that one could ever hope for. The central thesis is that political marketing isn’t just about slogans and posters in the lead up to an election, but is instead an approach that should permeate every aspect of a political organisation. It’s worth noting that Jennifer Lees-Marshment is a career academic and if you’re looking for a quick insight into how political parties go about trying to get our votes, brought to life by light anecdote, this isn’t the book for you. Lees-Marshment combines 100 interviews (over 5 years of research, across 5 western liberal democracies) of heavy weight political marketing practitioners with her keen understanding of the wealth of existing academic literature on the subject. Undoubtedly, the highlights of the book are the musings of communication directors, political representatives, pollsters and strategists including (amongst many others) Alastair Campbell, Iain Duncan Smith and Philip Gould, on their various electoral battles. Indeed, one wonders if the transcripts of the interviews would be worth publishing in their own right. Jennifer Lees-Marshment breaks down what it takes to successfully market a modern political party and / or candidate into its component parts and her findings are as relevant to a candidate fighting a local council seat as they are to a team of people who covet the highest of office. She sets out the relatively simple principles behind what it takes to win the Political Marketing Game: effectively communicate a clear, motivating brand proposition that is credible and differentiates you from the competition. Sounds simple. But case study, after case study reveals just how difficult it is to arrive at, and stick to, a strategy that fulfils on such principles. The multiple pitfalls include the ‘tyranny of the urgent’ created by the 24 hour news cycle, party disunity, pandering to polling, ignoring polling, being overly negative towards the opposition, disregarding the opposition and many, many more. The book reaches a slightly unnecessary and unrealistic conclusion by proposing that we are on the brink of entering into a ‘partnership democracy’, whereby political elites and the public reach mutual understanding and respect via a virtuous circle of democratic participation and open decision-making. However, that doesn’t take away from the fact that this is a hugely informative study on an important field that is changing and developing at an extraordinary rate. (Originally published in Progress Magazine).